Clive best: The real cause of Ice Ages – Resonant dust clouds? This repost is from Clive Best’s Excellent blog. In it, he frames an interesting and plausible argument for interplanetary dust being responsible for ice ages. Part of the argument rests on the switch in frequency from ~41Kyr (Milankovitch cycle of Obliquity) to ~100Kyr (Milankovitch cycle of orbital eccentricity), and the fact that the TSI variation caused by the latter is small of itself. The real cause of Ice Ages – Resonant dust clouds? This post proposes that regular variations in interplanetary dust between the Earth and the Sun is the primary cause of recent ice ages whose oscillations have been parameterised here. The Milankowitz theory of insolation is able to well explain the continuous 41,000y climate oscillation but it cannot explain why a 100,000y cycle became prevalent during the last million years, even though it is in phase with orbital eccentricity of the Earth’s orbit around the sun. A different origin for the emergence of the 100,000y cycle of major ice ages is proposed. This is based on the hypothesis that a large comet broke up close to Earth’s orbit about 3.3 million years ago, leading to an increase in inter-planetary dust whose density eventually phase locked to variations in Earth’s eccentricity. This process is able to explain the cooling trend starting 3 million years ago eventually leading to major eccentricity driven glaciations with persistent modulation in insolation from the obliqueness cycle. Evidence in support of regular cycles in inter-planetary dust density have been found in ocean sediments, and there is some evidence of a comet fragment impacting with Earth at 3.3 million years ago. Milankowitch cycles inducing insolation changes in the polar regions is the generally accepted primary cause of Ice Ages. However the details for insolation changes due to the ellipticity of the Earth’s orbit don’t really work out. Although the insolation varies by 6%(today) up to 20% between perihelion(currently southern hemisphere summer) and aphelion(currently northern hemisphere summer), the net annual change for the Earth is insignificant. The poles themselves are unique places because they essentially experience just 1 day and 1 night per year. For the North Pole the sun rises at the spring equinox and sets again at the autumn equinox. At mid summer’s day the 24 hour insolation reaches average values higher than at the equator. The winter night then follows resulting in zero insolation for the next 6 months. This also explains the rapid melting and freezing cycles observed in polar regions. 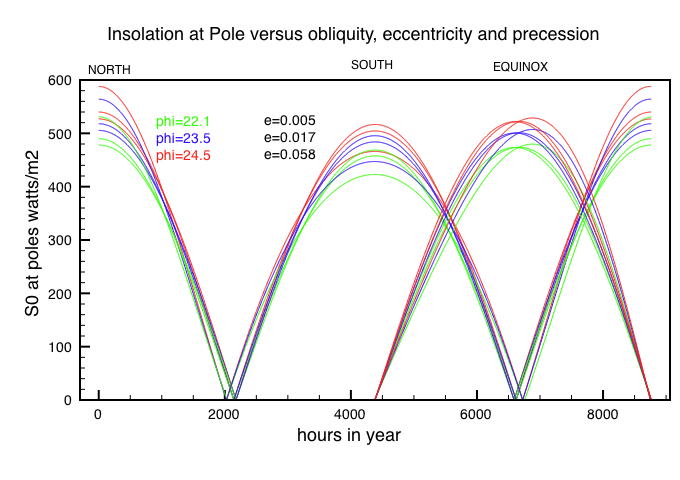 Data used for insolation calculations at the poles are the three Milankowitz cycles of Orbital Eccentricity, Obliqueness and Precession originally calculated by  are taken from the Nasa site. The insolation is then calculated by tracking the orbit through the year on an hourly basis. Sample results are shown below. The effects on maximum insolation, which effects summer melting rates of ice at the poles, is evident for both obliqueness and precession. However the effect of changes in the orbital ellipticity is more subtle. An increase in insolation for one pole close to perihelion is offset by a diminished insolation for the other pole. Later in the precession period when the poles are positioned at the equivalent of todays equinoxes, the polar insolation is similar to that of a circular orbit. Overall the net annual effect of eccentricity of the Earth’s insolation is negligible. For the last 900,000 years however, Ice Ages show a clear correlation with ellipticity at 100,000 years and this remains unexplained. The basic problem can be seen better by calculating long term insolation trends. Figure 2 shows the maximum and total insolation for the poles over the last 600,000 years. The main effect of ellipticity is to modulate the effect of the precession terms at 23,000 years. Indeed if the orbit was circular then the precession of the equinoxes would have no effect whatsoever. However the direct effect on insolation of the increase in ellipticity of the Earth’s orbit averaged over a year is negligible. This is the paradox as to why regular glaciations and warm interglacials occur every 100,000 years in phase with the eccentricity. 1. The observed gradual decrease in temperatures starting just over 3 million years ago. 2. The 43,000 year continuous signal dominated until about 1 million years ago when the onset of 70-100,00000 glacial cycles begin. Why did this happen ? 3. What is the cause of the recent 100,000y glacial cycles, since Insolation changes caused by ellipticity are too small to be an explanation ? 4. Why did the frequency change from about 70,000 years between 900-700,000 ybp to the current cycle of 100,000 years ? 5. Why is the larger 400,000 year eccentricity signal absent from recent data ? Muller et al. have proposed an alternative explanation for the 100,000y cycle. They suggested that the driver is the change in inclination of the Earth’s orbit. This follows an 80,000 year cycle relative to the current ecliptic plane, but when projected to the invariate plane defined as the centre of mass plane of the solar system this is extended to 100,000 years. The physical process envisaged is that the interplanetary dust cloud is centerd on the invariate plane and the Earth passes through this during its orbit. Evidence from ocean sediments show a 100,000 year cycle of H3 deposits associated with cosmic dust . In effect, changes to orbital parameters of eccentricity, inclination and longitude of ascending node are all caused by the mutual gravitation of solar system planets as they orbit the Sun. Similarly all bodies in the solar system will follow such cycles including dust clouds. Let’s investigate correlations of inclination and glaciations. Figure 4 shows the data as given by  compared to the benthic foram stack. The hypothesis that the Earth passes through a static interplanetary dust cloud aligned with the invariate plane attenuating sunlight is attractive. Furthermore there is direct evidence in ocean sediments of a regular 100,000 cycle of He3 deposits . Unfortunately the data do not seem to support inclination as being responsible, despite the similarity in timespans. One would expect colder temperatures at low alignment where presumably the Earth crosses the dust plane. The correlation with eccentricity is better with high eccentricity seemingly algning with warmer interglacial periods. So what is really happening and can we explain how the climate changed to regular glaciations ? First we try and estimate if there is today an observable effect of interplanetary dust attenuating the solar constant as measured accurately by satellite. The measured average solar constant over the orbit is 1361 watts/m2 . This implies therefore that currently during an interglacial maximim on average 7 watts/m2 is absorbed (or scattered) by interplanetary dust currently lying between the earth and the Sun. In addition accretion of dust by the atmosphere which is estimated at 40000 tons per year will also slightly reduce sunlight incident on earth. Therefore it is proposed that variations in the dust cloud aligned with the Earth – Sun ecliptic plane is the origin of recent Ice Ages. 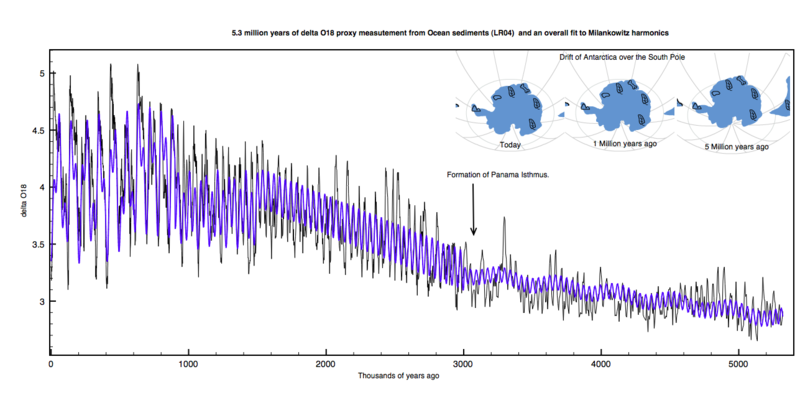 Until 1 million years ago, colder glacial periods were driven by variations in obliquness induced insolation. However this changed presumably when the dust cloud settled into harmony with the Earth’s orbit. For the last million years “Milankowitch” variations in the eccentricity of the orbit have also applied to the dust cloud inducing regular variations in density distributions thus causing variations in the solar constant. A hypothesis that can explain the slow cooling of the Earth, the onset of ice ages and their transition from 43,000 y to 100,000y dominant cycles is as follows. Some 3.3 million years ago a large comet breaks up near the Earth creating a large irregular dust cloud lying between the earth and Sun. There is some direct evidence of a collision of a significant cometry fragment with the Earth at this time from Argentina . Initially this irregular dust cloud orbited the sun and acted to gradually reduce temperatures on Earth as it condensed into a Earth-Sun ecliptic orbit. The cloud gradually spread out into a disk in synchronous orbit with the Earth around the Sun. Variations in the orbital eccentricity of the Earth are caused by the regular combined gravitational forces of the outer solar system planets. Exactly the same forces will apply to the dust cloud now in synchronous orbit. However, the low mass of particles in the cloud accentuate the orbital effects especially in eccentricity. Thus we can envisage a current dust cloud whose density and shape is moulded by those same eccentricity forces as that on the Earth. Initially the diffuse cloud caused global cooling for 2 million years after breaking up. Slowly as the dust cloud settled into the ecliptic plane it became resonant with the orbital effects of the Earth. When the Earth is at a maximum of eccentricity in the 100,000y cycle the dust cloud is spread in an elliptical cloud with much of it lying outside the Earth Sun line of sight. As the Earth resorts back to low eccentricity and a more circular orbit so too does the dust cloud leading to an increase in dust density lying between the Earth and the Sun. This effect is shown schematically below. Schematic of interplanetary cloud density variation with orbital eccentricity of the Earth assuming a cloud resonant to the Earth-Sun orbit with a similar planetary gravitation forces. This model of an interplanetary dust cloud resonant with the Earth’s eccentricity cycle predicts that the following phenomona should be observable. A slow decrease in the solar constant as the density of dust increases with falling eccentricity. Evidence of more dust external to the earth’s orbit along the aphelion axis compared to the perihelion axis. A higher density of dust between the Earth and the Sun at perihelion rather than at aphelion. This could be reflected in a slightly lower value of solar constant at perihelion than otherwise predicted. In addition the Zodiacal light should be more intense at perihelion than aphelion. A doubling of CO2 levels in the atmosphere by the end of this century will cause a direct radiative forcing of 5.3Ln(2) watts/m2 or 3.67 watts/m2. IPCC models usually assume a further feedback mainly from water vapor of 2 watts/m2/degC. A reasonable assumption would be that AGW would induce a warming term of about 5-6 watts/m2 after which CO2 levels are expected to stabilize. The net effect of all human induced global warming could be to increase radiative forcing by something like between 4 and 8 watts/m2. The eccentricity of the Earth’s orbit is currently decreasing with cooling beginning in 2000 years time leading eventually to another intense Ice age after 20,000 years and lasting a further 60,000 years. 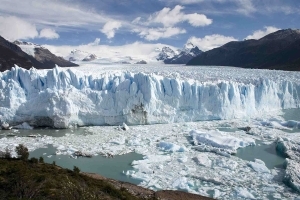 A new Ice Age would be disastrous for human and animal life at higher latitudes. If this theory of a variable interplanetery dust cloud is correct, then AGW will likely delay the early onset of the next ice age. To fully offset the cooling effects of a thicker dust cloud, it would be necessary to keep CO2 levels above about 700 ppm for another 70,000 years. A new possible cause of Ice Ages is proposed based on an increase in interplanetary dust for lower eccentricities of the Earth’s orbit for the last million years leading to large cooling of the Earth. This is proposed as the cause of the switch from glaciations driven by the 43,000 year variation of insolation due to obliquity to a 100,000 eccentricity driven cycle. The next cooling cycle should begin in 2000 years time reaching a glacial minimum in about 10,000 years time lasting 70,000 years. At the same time anthropogenic global warming may delay the cooling trend if induced temperature rises of 2-3 degrees occur and defer the next glaciation if CO2 levels were to stabilize at ~700 ppm for 80,000 years. A good analysis. however, the 41 ky to 100 ky transition coincided with the formation of the Isthmus of Panama between 1.25 million and 700 ky ago. So, the end of ice ages is connected with the ocean current system and its interaction with the Antarctic ice pack. There is a potential mechanism and it is apparently consistent with palaeoclimate but you have to change aerosol optical physics as well. There may also be a cosmic dust influence but are the timings right? Yes, you’re right about the date: the latest date for Isthmus closure I have found is 1.9 MY. However, the ice age periodicity change followed this. Clive: I’ve emailed Leif to ask if non-seasonally adjusted TSI data is available. 4.57 Watt/m2 energetic decrease for 1 million km higher Sun-Earth distance…..
converted to (divided by 4) as “4.57 m2-terrestrial” scale…. The left axis shows the TIM data and the theoretical data for Earth-Sun orbit (sine wave). The difference between the two curves is then plotted as the black signal scaled to the right y-axis. The red curve is a calculation of the lunar phases based on a siderial month of 29.53 days using an arbitrary scale for comparison. At full moon the Earth is approximately 4000km nearer the sun ! The Earth-Moon system orbits around its centre of gravity which lies about 4000 km from the centre of the earth. Consequently the Earth-Sun distance varies during the lunar month. The moon has other subtle effects on Earth’s climate. 1) Moonshine (reflected energy from the sun) 2) Atmospheric Tides – largest effects at the poles 3) Deep ocean currents from tidal effects. In a periodically forced nonlinear oscillator (if we take this paradigm for the earth climate system) its not impossible to envisage the system flipping between being forced from one to another of several external periodic forcings – i.e. changing from following the 41 kYr obliquity cycle to the 100 kYr eccentricity cycle. For me this almost makes it more credible that we are looking at such a nonlinear oscillator balanced between weak and strong forcing. Strong forcing is where the forcing frequency is the same as the system’s frequency (e.g. pushing a child on a swing), weak forcing is where the responsive frequency is very different from the forcing frequency and variable. Nobody is really certain what causes an ice age to start, but one possibility is increased dust in the atmosphere, either from a volcano, or from a large meteorite impact. This dust would then increase the world’s albedo, cooling it down, and causing more snow and ice to form, increasing the earth’s albedo still further. Such a possibility would also have to explain why glaciations follow regular 100,000 year cycles. This could work if a large comet with an orbital period of 100,000 years deposited large amounts of dust triggering the cooling cycle. The obliquity cycle (changes in due to solar irradiation due to the tilt angle of the Earth’s axis) would be unaffected. Hello Lee, says the co-moderator. We are all dumb when it comes to not known. The topic is is part of a frequent subject on the Talkshop as some contributors and commentators try and unravel what goes on very long term between the earth and sun. At the moment most eyes are on a long saga, so there is little activity on other threads. I wonder about the purported persistence of such a cloud, in the face of solar winds etc., and periodic CMEs which would disrupt it and clear channel. New idea for space travel? – A maverick physicist thinks laser power might one day take humans to the stars. However, gravity would also be attracting those same particles both to the sun and planets, so I expect it would take a long time for all of it to be removed. Perhaps long enough to start the NH freeze, which would increase Earth’s albedo by reflection from lower latitude snow and ice and cause a return to ice age conditions. The observation of Gegenschein and Zodiacle light show that there is persistent dust sitting in the plane of the ecliptic, balanced between the bombardment of photons and gravity.